I have a friend who likes to travel. She is a very thoughtful friend who has my taste buds in mind when she buys treats from the places she visits. Recently, her travels took her to Greece, so I got a box of delicious "sesame treats." The ingredient list was short: sesame seeds and honey. For one ounce, my sweet tooth was satiated at a cost of about 110 calories. That got me thinking about sesame seed nutrition. By weight, sesame seeds are mostly heart-healthy fats, followed by carbs and protein. They are also high in lignans – plant phenols that are powerful antioxidants. Although sesame seeds are good sources of many vitamins, they are particularly high in thiamin, a B-vitamin important in carbohydrate metabolism. They are also high in minerals, especially copper, iron, magnesium, manganese, and phosphorus. Does this list look familiar? Legumes, or dried beans and peas, are also high in these nutrients – see "Beans for 2011" posted January 4, 2011. As with other seeds and nuts, sesame seeds are high in calories since they are mostly fat. One ounce, or about 3 tbsp, provides about 170 calories. A little goes a long way – just keep an eye on your portion size. Halvah: tahini fudge. This is like heaven in my mouth - very sweet, rich and satisfying. Calories vary depending upon type, but 1 oz will run you about 140 calories. Sesame Treat: sesame seeds and honey. It has a rich, "toasted" flavor with a really sweet kick - about 110 calories per ounce. Baba Ganoush: roasted eggplant with tahini – a divine dip with a lot of flavor. Has about 60 calories for 2 tbsp. Great with veggies, pita or any type of cracker or chip. Hummus: Chickpeas with tahini – a hearty dip that goes great with just about anything, I like it with pita bread, in my salad, and as a dip with veggies. Most versions contain about 70 calories per 2 tbsp, but I found a recipe from Cooking Light that contains only 44 calories per 2 tbsp. All varieties of sesame seeds are nutritious, and lightly toasting them does not diminish their nutrient content. However, use unrefined sesame oil for uncooked dressings, sauces, or as additions to cooked food. That is, treat it as you would a fine extra virgin olive oil or walnut oil. Actually, unrefined sesame oil has a smoke point of only 350F, which is even lower than extra virgin olive oil. If you need to cook with sesame oil, then use one that is semi-refined and keep the heat below its smoke point of 450F. 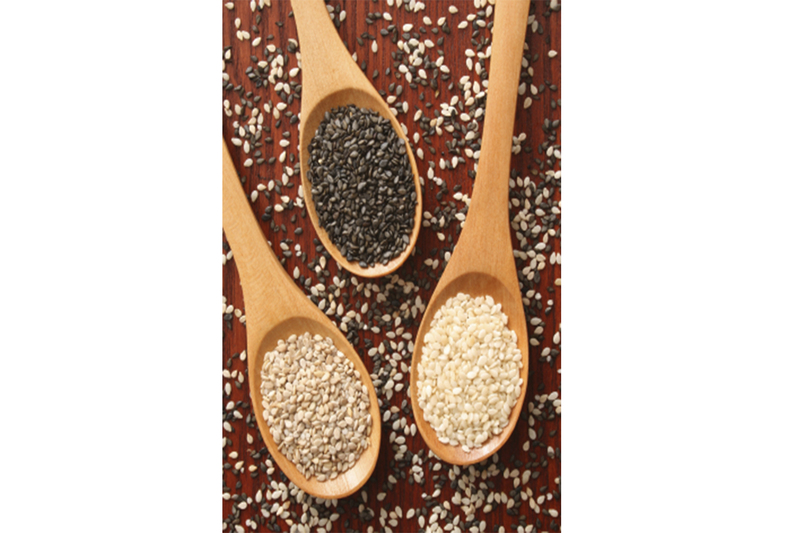 Want to see the full list of nutrients for sesame seeds and tahini? Go to MyNetDiary on the web, click on FOOD tab, select a generic sesame seed or tahini food item, click on "Food Details" and then click "More Nutrients" to see the full nutrient profile. Generic items come from the USDA's original nutrient database, so these items will have data on nutrients not required on food labels. Brand items will provide data for nutrients required to be listed on the Nutrition Facts panel, and will not typically report data for any other nutrient.